Year-in, year-out, one of our simplest pleasures is watching song birds at our feeders. It is a pleasure that is shared by millions of people around the world. Regardless of the season, regardless of the locale, watching tiny bits of feathers and down flit about at the feeding stations set out in the backyard for them is a source of joy and continual wonder for all. Is there anything more irrepressibly optimistic than a Black-capped Chickadee cracking open a sunflower seed on a sunny, sub-zero day? Even on the darkest, dreariest days of a Wisconsin January, the tiny birds bounce around the feeders with cheerful energy and sing their raspy song. The constant activity at the feeders proves that the world is not stilled at -20°f. And when spring arrives, new bird songs fill the air. It’s a musical harbinger we wait for all winter. The arrival of the spring migrants changes the scene. Mating rituals fascinate the observer and the sight of new nests in nearby hedges prove that some things will always be. The single-mindedness of nesting songbirds is a lesson in tenacity. 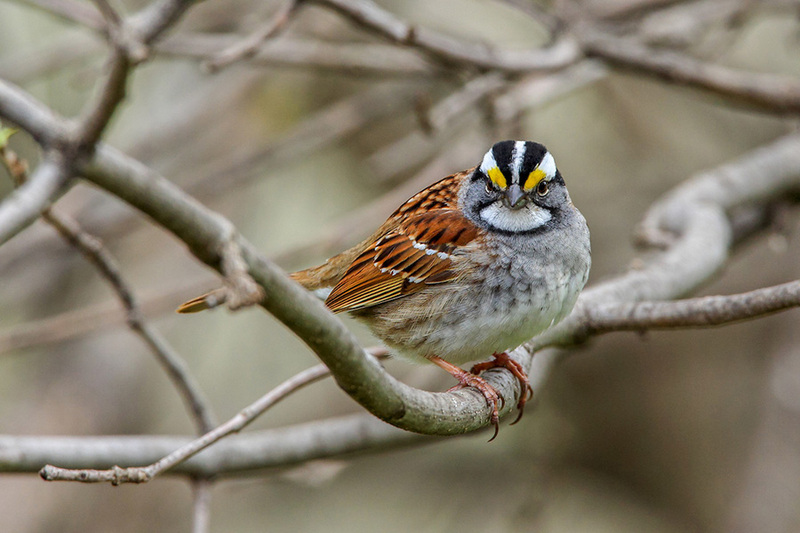 A White-throated Sparrow with spring breeding plumage. Not all our birds remain with us though the summer. Multi-colored Warblers pass through our area by the thousand, and brilliant blue Indigo buntings tarry with us for a few weeks before finding the densest thickets north of us. White-throated Sparrows scuffle through fallen leaves for only a short while before they, too, head north to find a quiet trout stream to call home. 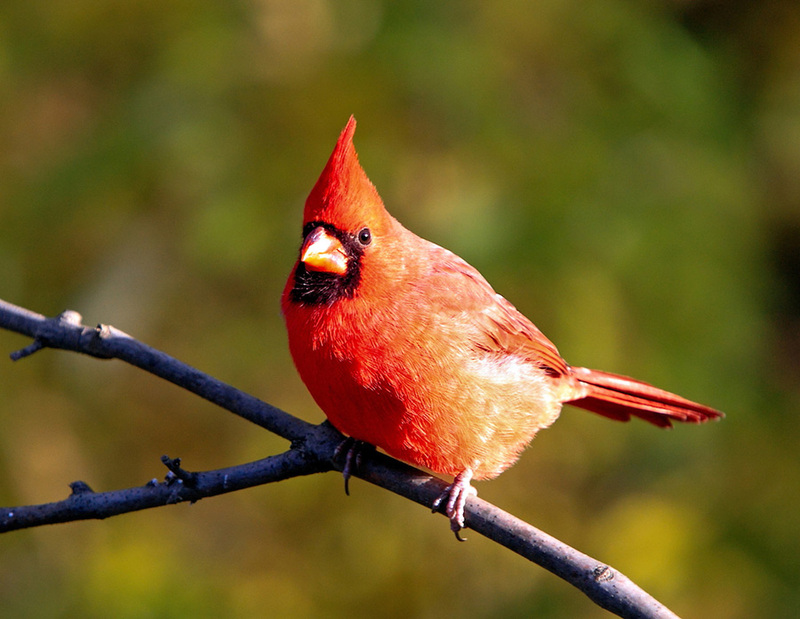 A male Cardinal, with its distinctive crest and black mask. But some do stay. When the resident hatchlings – the baby Wrens, Catbirds, Nuthatches and Cardinals are born, their incessant hungry cries result in a perpetual flurry of activity at the feeders and birdbath. It is always busiest at our feeders then. As summer wanes an influx of new birds, fresh from the north, appear at our feeders like clockwork. Warblers and Crossbills, Grosbeaks and Redpolls all jockey for position on the sunflower seed-spewing perches and the rim of the feeding trays. 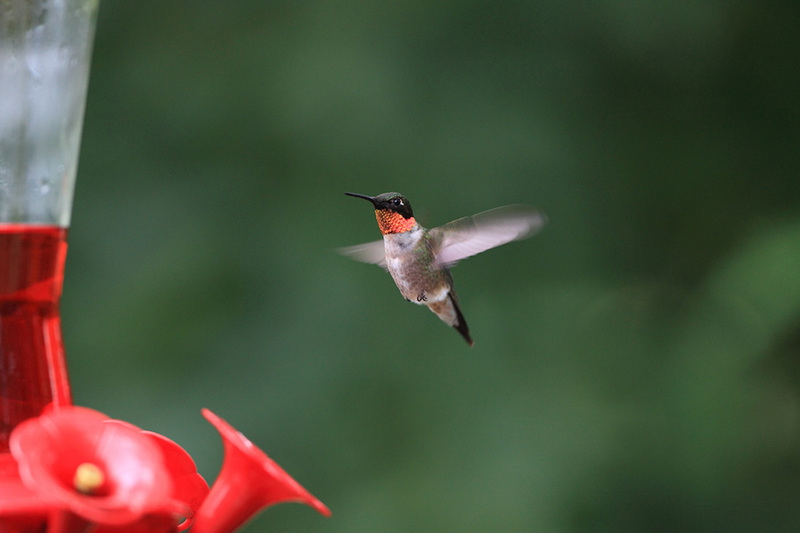 A male Ruby-throated Hummingbird at a feeder. When the last Ruby-throated Hummingbirds depart in early autumn, it’s clear that frigid nights and fall colors are not far behind. Then the autumn leaves vie with the birds for the honor of “most beautiful” sight. By keeping a wide variety of seeds and a fresh water supply available, we have learned that the number and species of songbirds arriving will continue to amaze long into the cold of late autumn. Indeed, clean water is the elixir which keeps the birds coming here, month after month, year after year. It will attract them into the depths of winter, and it brings them back early in the spring. In return for the food and the water, the cheerful, colorful little birds brighten our lives by their very existence. I don’t know how we’d get through the distinct and disparate Wisconsin seasons without them.